Here is my drawing of the filtration system I wanted to build. 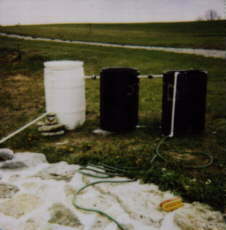 I already have a Little Giant pump in the pond currently pumping water through two small filtering systems. Here is the result, built April 15th. These are industrial grade plastic 55 gal. drums. The filters are layered as in the drawing. The landscaping around these filters will consist of a streambed, built up, running from the left drum, back into the pond, and flowers hopefully, or fencing of some type, to hide the drums from sight. In the two days this system has been running, the quilt batting has become as green as the grass in the picture from the algae it has filtered from the pond water. 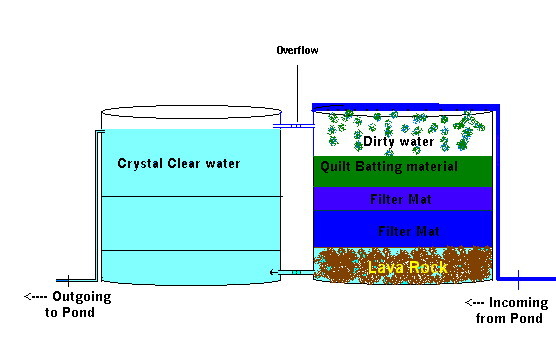 Depending on the results of a week or two of testing, there may be layers of filtering material placed in the second drum. 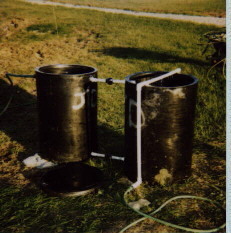 There are unions connecting the two drums, which allows the filtered water to flow from the bottom of the first drum to the second drum. The clean water then flows from the top of the second drum back to the pond. The top connection is an overflow, which allows excess water to flow into the second drum if necessary. Each drum has a faucet in the back to facilitate draining for cleaning and winter storaging. After running the above filtration system a week, I found more needed to be done. So another barrel was added, as you can see from the picture, and the layers of filter media were switched around. Barrel #1 has in it lava rock, along with a thin layer of quilt battting. Barrel #2 had a layer of rock, then a layer of large gravel, and a layer of sand placed in it. Barrel #3 now has a thick layer of quilt batting in it. After just a week of the pond water being filtered in this system, the water is clear. At You were seen as visitor number since the counter was reset on 4-17-97.